Detailed Synopsis: The Medieval and Renaissance blade, a profound and beautiful object handcrafted by master artisans of old. An object of great complexity, yet one with a singular use in mind- it is designed to kill. The truth of the sword has been shrouded in antiquity, and the Renaissance martial arts that brought it to being are long forgotten. The ancient practitioners lent us all they knew through their manuscripts. As gunslingers of the Renaissance they were western heroes with swords, and they lived and died by them. Yet today their history remains cloaked under a shadow of legend. About The Film: The sword reigned supreme as the weapon of choice for thousands of years, yet upon the advent of gunpowder it was eventually supplanted by more efficient weapons. Nevertheless, the sword has lived on in part as a great symbol, shining brightly in some of Hollywood’s biggest movies. 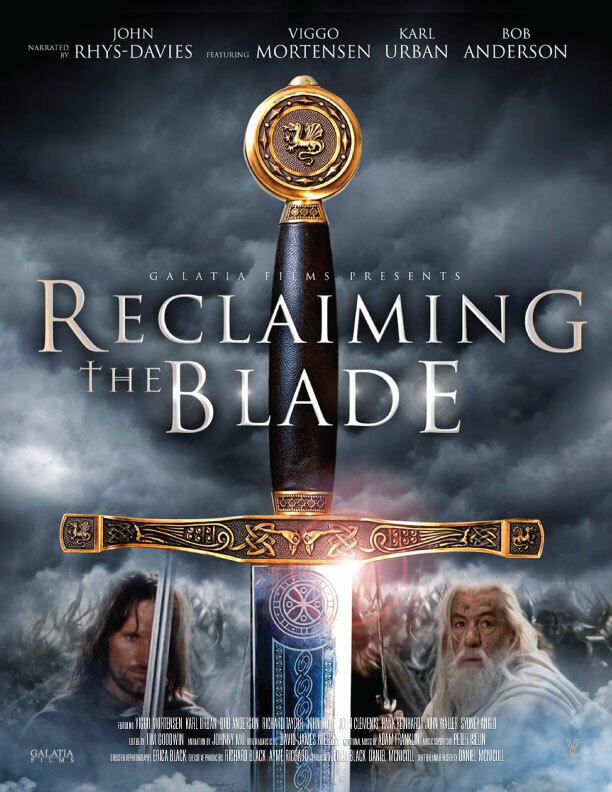 Reclaiming The Blade rediscovers the original history of this ancient weapon. Narrated by acclaimed Welsh actor John Rhys-Davies, this feature documentary traces the sword’s true history throughout the ages. The film brings to life our fascination with swords in popular media and the emergence of a worldwide movement to reclaim the ancient art of medieval and renaissance martial arts. 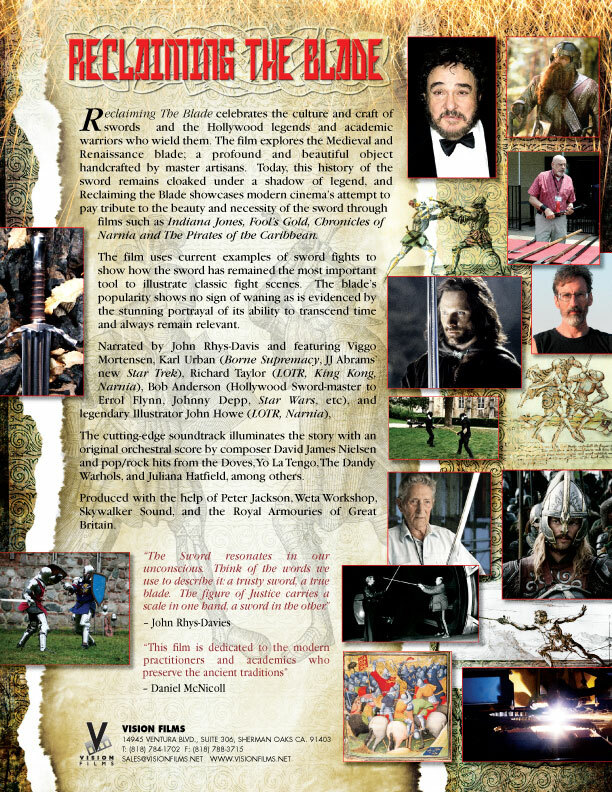 Reclaiming The Blade was initially born out of writer/director Daniel McNicoll’s research on historical warfare for the script, Glastonbury: Isle of Light. His personal interest in the sword and devotion to research helped get the project off the ground. Producer and director of photography Erica Black recalls, “Daniel's enthusiasm and creativity are contagious and I could sense this was a story that needed to be told. Up to this point, Historical European Martial Arts have been over-shadowed by the more culturally popular Asian Martial Arts. While both East and West have much to offer in this field, I felt that Western Martial Arts were largely an untold story.” Rhys-Davies shared in McNicoll's affinity for the blade and has a deep appreciation for the project: “The sword resonates in our unconscious. Think of the words we use to describe it: a trusty sword, a true blade. The figure of Justice carries a scale in one hand, a sword in the other.” Production started in October of 2005. Principal photography continued over the next year and a half. “Initially we thought the story was going to be much more specific, covering only a few characters," recounts Black "but along the way, the film gained a greater scope with the sword really becoming the central character of the story. The filmmakers traveled the globe to talk with historians, archaeologists, research scientists and renaissance martial artists from Europe, America and Asia. Galatia Films sat down with Hollywood actors, the swordmasters who train them, and those who produce the swords for the blockbusters they star in. The result has carved out a new path for documentary filmmaking. Through the combination of historical research and good old-fashioned Hollywood swashbuckling, Galatia Films have created an in-depth and entertaining exploration of a long-neglected aspect of history. Featured Interviews: The group of experts interviewed in Reclaiming the Blade reads like an A-list of the film industry's top actors, fight choreographers, and special effects artists. World-renowned academics and historians were also included in the film. +Bob Anderson, a legendary Hollywood fight choreographer and swordmaster who trained many top actors on some of the biggest films, from Errol Flynn to the lead actors in The Lord of the Rings and Pirates of the Caribbean trilogies, as well as performed in and choreographed many of the original light saber duels in the Star Wars films +Dr. Sydney Anglo, published historian with Oxford Press, senior advisor to The Association for Renaissance Martial Arts (ARMA), a Fellow of the British Academy, leading historian of historical fencing, and author of “The Martial Arts of Renaissance Europe” +Viggo Mortensen, award-winning actor with several sword-wielding roles including “Aragorn” in The Lord of the Rings trilogy and “Diego Alatriste in Alatriste +Karl Urban, actor, noted for his role as “Eomer” in The Lord of the Rings trilogy and “Ghost” in Pathfinder, among others +John Clements, ARMA Director, a leading authority on historical fencing and one of the world’s foremost practitioner-instructors of Medieval and Renaissance fighting methods +John Howe, famed illustrator and conceptual designer, best known for his work based on J. R. R. Tolkien’s literature and Conceptual Designer on Peter Jackson’s The Lord of the Rings movie trilogy and Disney's The Chronicles of Narnia, as well as the re-illustration of the maps for The Lord of the Rings, The Hobbit, and The Silmarillion +John Waller, the Creative Director of the Royal Armouries Museum, author and Hollywood fight choreographer, whose film credits include Robin Hood and First Knight +Richard Taylor, creator, director, and effects supervisor of the Academy-award winning film prop and special effects company Weta Workshop, which has produced sets, costumes, armour, weapons, and miniatures for many films, including The Lord of the Rings trilogies, The Chronicles of Narnia, King Kong, and many others +The late Hank Reinhardt, renowned specialist in arms, armor, and historical combat, founder of Museum Replicas, Ltd, featured in multiple training DVDs, and published author Additional Features: Reclaiming the Blade includes clips showcasing some of the most memorable cinematic sword fights ever filmed. Exclusive footage is also included of top historical martial arts students and trainers from the United States, Europe, and Asia. The documentary showcases collegiate sword tournaments and highlights historical martial artists teaching from re-discovered ancient manuscripts. Also featured is a rare archaeological find – remnants of a sword thirteen centuries old. Rhys-Davies recorded his narration on the Isle of Man within the Irish Sea halfway around the globe. "I sensed [McNicoll’s] passion for the piece,” he explains. “When the session was over the two studio technicians came up to me and remarked how they had been fascinated, and how they were looking forward to seeing the finished piece. Me too!" A Global Journey: The filmmakers traveled three continents over ten different countries to interview and capture demonstrations by well-trained practitioners and scholars. Europe particularly presents an extremely rich culture of Western Martial Arts groups. The film features footage from Renaissances Martial Arts groups throughout Europe, including Sweden’s Stockholm Historical Fencing Society and London’s Schola Gladiatoria. Also included from Europe are the well-known Boars Tooth Fight School, The School of Traditional Medieval Fencing, France’s De Taille et d’Estoc, Germany’s Arts of Mars, and Poland’s Ring-schule Wroclaw ARMA-PL. The filmmakers discovered an abundance of previously untapped resources. “One of the most difficult parts in creating the film was knowing exactly what to include", remarks Black, "There are so many individual threads to this story. Given unlimited time we would have liked to explore each and every one. In the end though, I hope this will lead us to a greater opportunity to delve deeper into this subject in the future.” The film poignantly portrays the link between yesterday's history and tomorrow's future. A new generation is actively seeking to better understand their current role within the story. They endeavor to do so by reaching back in time to humbly learn what they can from the ancient sword-masters. “With the rediscovery of many European self-defense manuals,” states McNicoll, “now is the time for Reclaiming the Blade to shed new light upon the subject. This film is dedicated to the modern practitioners and academics who seek to preserve the ancient traditions.” Director's Statement: The originality of the idea and the discovery of new things, seems paramount to me when considering new projects. Storytelling and exploration led me to Re-claiming the Blade. The research process can be very exciting, and the film gave me the wonderful opportunity to learn more about a subject I was already interested in. About three years ago I was led back to the history shelves in search of a different kind of historical epic involving a number of famous battles scenes. I needed to learn as much as I could of European warfare from that period and specifically more about historical swordplay. I was surprised by the density of information available and the recent resurgence of interest in the subject. Today there are a multitude of ancient texts being studied and translated. Ultimately, I found a very large number of students and academics engaged in the process of rediscovering what they called Historical European Martial Arts. I was intrigued that there were so many groups already busy with the research and study of these ancient arms. A new and original story based on their work and enthusiasm soon followed. The true symbolic power of the sword is very compelling and the wonder of this long-forgotten martial art was evident to me upon a closer viewing. What I found was a simple yet beautiful art form in serious neglect, and to my joy many came forward to offer their support. As I made contact with the students, academics and Hollywood performers, I soon realized that I had hit upon something very special. It was almost as if I had released a pressure valve and suddenly I was standing amidst a floodgate of passionate storytellers. Those I spoke with were excited to be a part of this project and happy to bring their story to the forefront. In truth, much of what we set out to uncover had been lost in time for hundreds of years. The vast influence of the sword on modern society is evident. The popularity of the sword and European martial arts has reached new heights and the timing for this film just seems right. Articles such as the USA Today's "Martial Arts Take a Western Turn" proved what I had been so fortunate to witness firsthand. The intriguing subject of historical swordplay was experiencing a real renaissance. Taking the time to explore these things was the better part of working on Reclaiming the Blade. While working on the film various groups got involved, from the Illustrious Royal Armouries in Great Britain to world-renowned special effects studio, Weta Workshop. In addition to individual academics and martial artists who joined with us in bringing the sword to life, so also acclaimed fight choreographer Bob Anderson got on board. Bob trained everyone from Erol Flynn to Johnny Depp and was eager to bring his own magic to the film. In the end though, one of the greatest friendships forged was with Producer Erica Black. Without her ambitious spirit it would have been impossible to fully realize the dream of the film. She is a wonderful producer and to my delight she was one of the first to really believe in the project. Reclaiming the Blade delivers unique insights into both historical combat and theatrical swordplay. This movie is for the child within all of us, for all those who love adventure mixed with a dash of history. Swords and swordplay continue to dominate our stories. From the new Indiana Jones film to Matthew McConaughey's Fools Gold, from Nim's Island to A Bee Movie, The Chronicles of Narnia and The Lord of the Rings, these entertaining films continue to acknowledge our love for the blade. I feel honored to have played a small part in the grand legacy of the sword.